Aquaknight takes common plumbing products and looks for ways to improve them. The Aquaknight innovations can appear subtle at first glance but once you look a little closer, we’re sure you’ll agree that they are pretty darn clever. Best of all, all of these extra design features greatly reduce the possibility of problems occurring behind your walls a few years down the track. Also known as a water seal, the safety seal is a depth of water that is retained in the water trap. The purpose of this is to prevent foul air and gases escaping from the plumbing system and entering your home or building. In some cases, a poor safety seal can result in the spread of air-bourne disease. The building code determines that the minimum depth of a safety seal is 25mm but the ideal or recommended depth is 75mm. It’s up to the manufacturers to decide if they want to manufacture to the minimum or recommended standard. 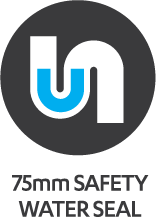 There are many products now available in New Zealand that manufacture to the minimum, however Aquaknight design all their products to the recommended 75mm safety seal depth because the bigger the seal the safer it is. Leak Return Ports. Taking Care of Rogue Moisture. Many may not be aware that the majority of reported leakages from acrylic showers actually originate from the top of the tray. To overcome this, Aquaknight have developed a unique patented system that diverts rogue moisture back into the waste system should a leak occur. 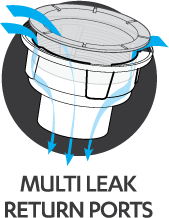 The rogue moisture is captured by the Leak Return Ports which are slots moulded into the top of the cup, which is a place where water commonly pools rather than draining away. This is an incredibly clever feature that eliminates risk of hidden moisture pooling between the floor and shower tray. Hair Claw. It Catches Hair. We’ve all experienced it at some point – a blocked or slow flowing shower drain. Hair is the common cause for blockages and we dread having to clear it away because it’s an awful job. Aquaknight’s Hair Claw allows you to easily remove hair from your shower drain. The Hair Claw sits inside the top of the drain, where it can’t be seen, and catches hair as if falls down the drain. 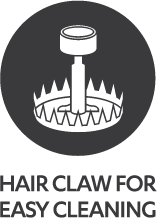 The Hair Claw is incredibly easy to access and clean. You don’t need any tools, you simply lift off the drain lid and then then lift the hair claw out for cleaning. The Hair Claw easily glides in and out of place. Looking for great quality plumbing products that stand the test of time?